Are Christianity and Science at War? Posted December 6, 2017 by Sheri Bell and filed under the categories Apologetics, Stuff for Teens, Talk for Today. I’m guessing God is totally cool with science. One major area of life that creates intense conflict is the debate between science and religion. Thanks largely to the media, many of us believe that science and religion are at war. The belief that Christianity is seemingly opposed to modern science is, in fact, one of the top reasons young people cite for leaving the Church. But is this idea accurate? Where did it come from? Cornell University President Andrew Dickson White, back in the late 1890s, is largely credited with inventing and propagating the idea that science and religion are adversaries in the search for truth. In his book A History of the Warfare of Science With Theology in Christendom, White cast Christians as fanatics who clung to scriptural claims that the earth was flat. Interestingly, White later admitted that he wrote the book simply to get even with Christians critical of his plans for Cornell. Today’s reality: many scientists refute the claim that science is the enemy of God. A study from 2014, for example, highlighted in an article by Christianity Today magazine, found 2 million U.S. scientists self-identify as evangelical Christians. If you were to bring all these scientists together, adds the article, they could populate the city of Houston, Texas. Most scientific pioneers, including Isaac Newton (1642-1727), Louis Pasteur (1822-1895), Francis Bacon (1561-1626), and Max Planck (1858-1947), intently pursued science because of their belief in God. Certainly, some Christians resist science. God, they say, created the world in six days, and to say otherwise is downright blasphemous. But the real conflict isn’t between theism and science. It’s between science and naturalism, which says that the world is the product of a blind, purposeless, unguided process. No one really believes an unguided process took place, because the opposite is clearly on display every moment. Our world is intricately intertwined. And discoveries in astronomy and physics have shown, beyond a reasonable doubt, that our universe had a definite beginning. Today’s scientists admit that this beginning logically points to a Beginner. The laws of physics that govern the universe are exquisitely fine-tuned for the emergence and sustenance of human life. The slightest changes in any number of physical constants would make our universe inhospitable. The most compelling and reliable explanation for why the universe is so precisely fine-tuned is that an Intelligent Mind made it that way. The vast amount of information (including DNA) contained in living organisms points to an Information Giver. We all recognize that our belief and unbelief have more to do with psychology than with rational argument. Jesus tells us to love God with our full heart, soul, strength and mind (Mark 12:30). So, clearly, Jesus wanted people to reason the truth of His claims, in order that they might fully commit to seeking after Him. When Jesus and the apostles called upon a person to exercise faith, it was not a “blind faith,” but an intellectual faith, based on Jesus’ track record of performing incredible miracles. You and I can believe, with unwavering faith, both because of Jesus’ historically confirmed actions and God’s “Divine footprint” all around us. 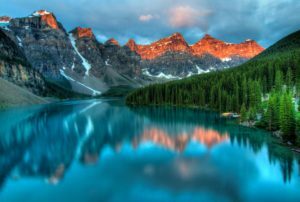 Adds Berlinski: Has anyone provided a proof of God’s inexistence? Not even close. Have the sciences explained why our universe seems to be fine-tuned to allow for the existence of life? Not even close. Does anything in the sciences or in their philosophy justify the claim that religious belief is irrational? Not even ballpark. That said, it’s so easy in our post-modern world to be persuaded to believe that God is a myth. A wealth of misinformation is available with a few clicks; a person looking for information that questions the truth of Christianity will easily find it. Take Darwin’s ideas on evolution, for example. If we listen to the media, atheists, and some scientists, Darwin’s theory is a proven deal. Really? No. Many of Darwin’s assertions have long been recognized by the modern scientific community as being completely wrong — yet school textbooks and other sources continue to position them as “truth.” The scientific community is fully committed to it, and typically views in lower regard scientists who have no problem seeing the compatibility of science and the sacred. Why? Because God, as creator, originator, and life-giver, is preposterous to those who refuse to acknowledge God. Unfortunately, there’s no silver bullet argument that proves Christianity; there’s no single argument that can force a person to believe. But if we can’t offer “undeniable” evidence that God exists — especially to people who have been taught repeatedly that only science can prove truth — should we take the time to tell them about Jesus? Yes, both because we love Him and because God tells us, in His Word, to do so. Think about it this way: when you enjoy a really great meal, you share all the juice details with people, right? Same goes for the new car or house you’re ecstatic about finally calling your own. So to not tell people about Jesus, when our gratitude for His sacrifice and daily love should be off the charts, is to live inauthentically and without true compassion for people. “But I don’t want to start an argument,” you might say. “Or it’s just too hard to bring up religion, with everyone saying don’t talk it these days.” The easy way around “talking” about religion? Live as a committed Christian. If you walk the walk, eventually you’ll be given opportunities to talk about Jesus. Who knows? God may have been working on a person’s heart for a while, and *now* is the moment that God has picked you to start a conversation about Christ. You simply have to be willing to gently nudge the door, when you sense God opening it. Science now has answers for many “how” questions — but it just can’t answer the “why” questions: What is the meaning of life? What’s important? What’s true? Why am I here? We who know Christ know the answers! Bone up on your knowledge of scientific advances, friend, for sure, so you can have thoughtful, humble conversations with those who believe science disproves the existence of God. But also bone up on your Bible reading and prayer. Get your witness on, Apologist! 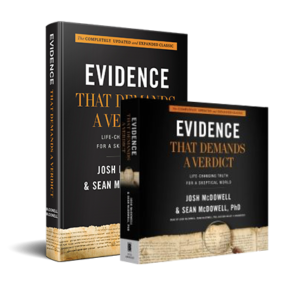 This blog post highlights Josh and Sean McDowell’s recently revised apologetics classic, Evidence That Demands a Verdict. We are certain this fully updated and expanded resource will be an effective evangelism tool for you, and strengthen your faith by answering the toughest questions tossed to you by skeptics. Know what you know, because it’s true. But share this truth with LOVE!